I bought Xena at one of the major bird stores in San Diego, CA. She looked perfect. However, it seemed that she didn't deal well with the stress of the move. She kept begging to be hand fed. Besides her constant begging for babyfood, I found that she was very "nervous"-- she kept falling and hurting herself. I checked around and was told that this was typical for African Greys: "They have heavy bodies and, if the wings are clipped too short, they will break open the skin over their breast bone ..." The vet said this, my Internet friends said it too and I stopped worrying. I padded the floor of the cage and the sutures healed nicely. But only one month after having gotten her first sutures, she managed to hurt herself again. Back to the vet she went. I started to wonder and asked him, "Are you sure she is alright? She should be eating by herself by now. She is over a year old! Her eyes seem so droopy. Isn't this a sign that something is wrong?" He looked at her and said, she is fine.He told me to stop worrying. But she didn't get better ... I made another vet appointment. Upon my request, the vet took blood and stool samples, and gave her another once-over. I again told him about my concerns, but he emphasized that he believed her to be fine. His words were: "She is fine. If she were a human being she would benefit from therapy," he joked. Still, I wasn't convinced. I decided to make an appointment with an avian vet in North County for a second opinion -- but Xena never made it to that appointment. The very next day, I found Xena crouched on top of her food dish. She was barely alive. My husband and I bundled her up in a towel and rushed to the emergency clinic. It was obvious that this was a real emergency and the vet took her from me immediately. She called an avian vet since she lacked the experience with birds. 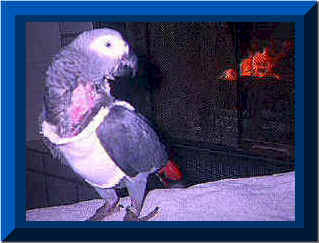 However, she did give Xena supportive care to keep her alive until the avian vet came. Dr. Cecil, who seemed very nice and knowledgeable, took good care of her. On a couple of occasions, it seemed like she was going to cease, but he managed to keep her going with CPR, electro shock and, following that, supportive care. It was heart- wrenching to see her this way. The vet indicated that they would need to stabilize her before he could find out what was wrong with her. He said he would keep her in the hospital over the weekend and, provided she survived until Monday, they would start running tests. On Monday, he mentioned "PDD" (Proventricular Dilatation Disease, a.k.a. Proventricular Dilatation Syndrome, a.k.a. Macaw Wasting Disease). PDD is a death sentence for any bird. The vet suggested a crop biopsy and we decided to go ahead, even though he said that a negative result wouldn't necessarily mean that she DIDN'T have PDD. Still, we decided to do it - if only for our own peace of mind. On Saturday morning I entered the vet's office. He had gotten the biopsy results on Thursday, but hadn't bothered to call me.. In his words: "I called Our Feathered Friends [name of birdstore where I bought Xena] ... I wanted to call you too, but didn't get around to it." He pointed out that there was no treatment and no hope for Xena. Something that I already knew. He mentioned quarantine. Anyway, I decided to give Xena a chance -- despite the vet's hopeless diagnosis. Xena did quite well with her liquid, soy-based baby food. I mixed the baby food with Pedialyte to prevent dehydration. I found that Xena did so much better on it than the bird baby formula. She didn't vomit as much as she did before and gained some weight. I spend as much time with her as possible. During the daytime she stayed with me in the office, and the evenings she would spend sitting on the loveseat in our bedroom. She liked to sit in front of the fireplace, and we spent hours cuddling on our favorite spot, and gazing into the fire. These were my special times with her. In her last weeks she grew increasingly dependent on me. She started crying whenever I left the room, and she tried to follow me, and in doing so kept falling (and missing the pads around her cage). Every evening, before falling asleep I would wrap her in a towel and then cuddle with her a while in bed, until I got sleepy when I would put her back into her cage that was right next to my bed. Then on a Friday, I woke up in the morning and saw that she had eaten through the sock and right through her skin. She had started to mutilate herself, feverishly picking at the wound that she had created. It was so painful to witness. My sister looked at me and said: "This poor bird.You know she is not going to get any better. Isn't it time? It was a hard decision to make. We bought a bottle of wine in the evening and my sister and I drank a glass in front of the fireplace while Xena looked on. Then Xena began begging for some of the wine. I offered her water, but "No, Sir!" she wanted wine. I told her no, "It's not GOOD for you!" ... At that moment my sister said -- with this dry sense of humor that is so typical of her: "Why not? Are you worried that it's going to KILL her?" At that point we both started crying and laughing at the same time.I suppose it was our way of dealing with this tragedy. It was a very very difficult evening for us.